As a leading screw machining company, screw machine products and precision turned products are the specialty of Cox Manufacturing. 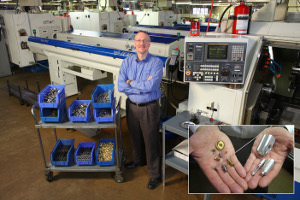 Our medical parts precision machining service offers our clients confidence -- a uniquely meaningful term if you are a designer or manufacturer of medical devices. As a leader in the screw machine products industry, the Cox name is a byword in medical manufacturing. Thanks to our trusted reputation for meeting exceptional requirements for intricate and highly complex components, we deliver the supply reliability our medical customers can’t live without. Behind it all is a knowledgeable, responsive staff of experts, and a quality heritage born when quality was a matter of pride as well as metrics. With our full line of CNC Swiss turning and multi-spindle screw machines, we are amply capable to meet our customers’ needs. We fully share our customers’ perspective: when lives depend upon it, nothing but a total commitment to excellence will do. In addition, Cox Manufacturing is equipped and experienced to offer more machining and material options. Cox Manufacturing customers have the freedom to specify components in hundreds of different metals and alloys, while enjoying a single high standard of confidence in Cox’s ability to deliver as promised. Whether taking on titanium alloys, stainless steel or the extreme precision of micromachining, Cox has the machines, the processes and the engineering solutions to manufacture for the next breakthrough. Cox delivers effective medical machining solutions for a wide range of products that continue to grow in complexity, even as they shrink in size. 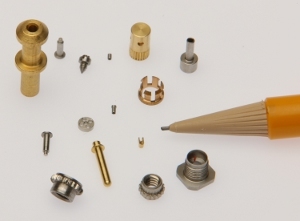 For example, parts such as miniature collets, biopsy collection jaws, and a wide variety of medical implant components have been produced at Cox with precision expertise. As a leader in the medical screw machine products industry, we maintain a vast array of precision machining capabilities, allowing us to produce quality medical components for devices such as articulating surgical tools and other medical components used in endoscopic surgeries. Orthopedic parts, medical devices and special luer products are just a few of an increasingly complex catalog of medical parts that have resulted in remarkable medical breakthroughs while testing the limits of manufacturing complexity and efficiency. Thanks to our trusted reputation for meeting exceptional requirements for intricate and highly complex custom components, we deliver the supply reliability our medical customers can’t live without. Cox’s reputation shines when producing miniature components for endoscopic surgical tools, cardiac LVAD related implant products, or metallic luer hubs designed for use in syringe applications. Cox manufactures millions of luer products every year, and has the expertise to reliably deliver needle or other medical connector products with luer features. Cox offers custom luer fittings, custom luer connectors for cannula applications, custom metallic connector hubs for syringe needles and much more. Upholding our high standards requires an exceptional commitment to manufacturing resources. The wide variety of machining technology options in the Cox machine library is supported by an in-house tooling capability that adapts tools to the unique characteristics of each material. Behind it all is a staff of engineers and machining experts with a 50+ year track record of adapting to both new alloys and tried-and-true materials. Material types include alloy, aluminum, brass, copper, stainless steel, plastic, steel, titanium machining. Contact us to discuss your next medical machining project with a Cox Manufacturing specialist.